Chris Stump of Onlyhammocks.com launched his site in October with a solid search engine-marketing plan. “Our original plan was pay-per-click from the start and search engine optimization as a long-term strategy,” Stump said. He got right to work, purchasing the domain Onlyhammocks.com through Yahoo! In January he hired a SEO company to help the site perform better in natural search. After a few months of low PageRank and only a few of his hundreds of pages indexed, it became clear that there was something wrong. “After three or four months, [the SEO company] was starting to get a little suspicious that the search engines weren’t indexing pages,” Stump said. Thinking Onlyhammocks.com may have been used previously, Stump consulted the Wayback Machine at Archive.org, a service that allows users to see the sites attached to domain names as far back as 1996. Entering the domain name “Onlyhammocks.com” revealed that while the domain name belonged to a legitimate hammock business from 2001 to 2002, it had become a spam site from 2005 to 2007. That explained the lack of indexing. Yahoo! and MSN had banned the site, and Google had penalized it. Stump said at first he considered purchasing a brand new domain name and transferring all the SEO company’s work to the new name. “With Yahoo! you can’t modify links to a new domain. We made the decision to just reach out to the search engines,“ Stump said. Stump submitted his site to Yahoo!, Google and MSN for re-inclusion and re-indexing in May. This is the only real course of action according to SEO expert Jeff Muendel with Netconcepts, a SEO and online marketing firm. “Along with switching the URL away from the old server, which the search engines should notice, the new owner can start a Google Webmaster Central account for the site and will have many tools to use there. He can also petition Google through that forum. The same can be done with a Yahoo! Site Explorer account,” Muendel said. Requesting a review is the easy part, though. Google spokesperson Jennie Johnson said the re-inclusion process for indexing a banned or penalized site “can take several weeks” after a merchant submits his or her request. For Stump, several weeks turned into several months. Even now, in late July 2008, little progress has been made with MSN and Google in getting the site reviewed. Yahoo! moved a little faster once Stump got through to the right people. “Yahoo! doesn’t have phone support for natural search. For all my requests, I essentially got a canned answer. After calling numerous times, I eventually got through to someone who spoke to the search group and got the site reviewed. That was maybe a month ago. Two days after I’d spoken with him, five pages were indexed. Now there’s a hundred plus,” Stump said. 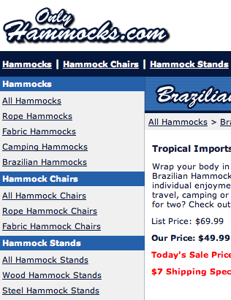 Several months after Stump’s requests were submitted, Onlyhammocks.com doesn’t show up in MSN search results. Google indexes about 10 pages. The home page PageRank is two, and the rest of the pages are zero. The home page, sitemap and a few product pages show up in Yahoo! search results. Unfortunately, Stump can do nothing but sit tight from this point until Onlyhammocks.com gets reviewed. He advises merchants to do their research before they bid on domain names, so they don’t have to take a number and wait for the search engines to get around to them later. Check out the domain name’s previous incarnations (if any) at Archive.org. penalized by looking at Google’s Webmaster Guidelines. If you’re purchasing an existing domain, use any one of a number of PageRank lookup tools, like this one at Blogflux. Look at the current site’s PageRank. If it’s an old site with a zero PageRank, something must be wrong. For an existing domain name, check to see who currently owns it by using the WHOIS Search at Infoservemedia.com. Then check the ownership against the Register of Known Spam Operations (ROKSO) at Spamhaus.org. There are 115 known spam operations on the list.